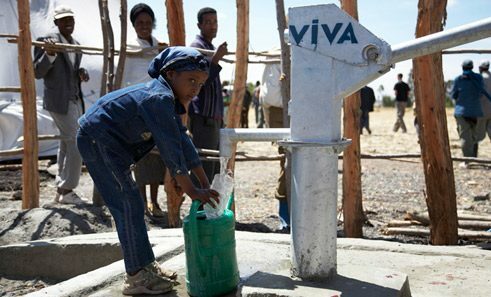 The Hamburg-based organisation Viva con Agua provides people in Africa, Asia and South America with access to drinking water. When Benjamin Adrion returned from a training camp in Cuba in 2005, everything had changed. Adrion, at the time a midfield player for the regional league football club FC St. Pauli, had seen how poor the supply of fresh drinking water was in Cuba. Back in Hamburg again, he decided to do something about it. Adrion mobilised the small world of musicians, football fans and bohemians in the Hamburg district of St. Pauli and launched an appeal for donations. Among the earliest supporters of the project were prominent figures like the hip-hop musicians of Fettes Brot and Bela B of the punk rock band Die Ärzte. In cooperation with Welthungerhilfe (German Agro Action), it subsequently proved possible to equip 150 kindergartens in Cuba’s capital Havana with water dispensers. In 2016, Adrion officially founded the organisation Viva con Agua de Sankt Pauli, an initiative that is seeking to provide people in poor countries with access to drinking water and sanitation. Ten years later, Viva con Agua has a permanent staff of 20 and supporters in more than 40 German cities, as well as branches in Austria and Switzerland. Viva con Agua has conducted projects in 15 countries, including Ethiopia, Rwanda, Kenya and Uganda. He’d always had the idea of getting involved in other things, off the pitch, says Adrion. In German Agro Action he found an umbrella organisation that was already familiar with the way things work in Cuba. The FC St. Pauli backs Adrion’s idea. The football club is well known for its social engagement and its close involvement with Hamburg’s creative and alternative scenes. “I don’t think that would have been possible with any other football club. Viva con Agua is only conceivable under these particular circumstances,” says Adrion. Over a period of ten years, Viva con Agua has helped provide access to clean drinking water and sanitation to more than half a million people, mainly in Africa, South America and Asia, mainly thanks to the efforts of 9,000 voluntary helpers worldwide. This support base is cultivated like a football club’s supporter group: Viva con Agua organises sports tournaments, sponsored runs and parties for the often young helpers. The advertising campaigns are witty and cheeky: “Wouldn’t you rather drill a well?” is the slogan on one postcard that shows a man picking his nose. German musicians like the rapper Marteria have written songs for Viva con Agua that can be listened to on YouTube. But the initiative’s principal source of revenue is probably collecting returnable cups at festivals and other large-scale events. Voluntary helpers ask visitors not to return their empty cups to the drinks stalls but put them instead in a Viva con Agua bin – thus donating the deposit. In the summer of 2014, that brought in nearly 100,000 euros, according to Viva con Agua. On top of this, there’s the other public and non-public support that Viva con Agua can draw on as a non-profit organisation. Since 2010, the Viva con Agua Wasser GmbH has also marketed its own brand of mineral water, which is sold in cooperation with regional water bottlers. Sixty per cent of the profits go to water projects. The Viva con Agua Wasser GmbH operates as a so-called social business, i.e. a company that seeks to solve the social and ecological problems facing society. Such initiatives may develop from a foundation, a non-governmental organisation or a business company. Some also begin life as startups, as in the case of the Goldeimer project. This Kiel-based initiative has been working together with Viva con Agua since 2010. It provides mobile composting toilets for large-scale events. Most of the profits are invested in Viva con Agua’s WASH projects, which are implemented by German Agro Action. WASH stands for Water, Sanitation & Hygiene. The projects are based on the principle that all three components have to be taken into consideration to achieve a sustainable provision of services. That’s why the people responsible not only build wells but also teach villagers the basics of hygiene and how to keep the wells in good repair. Eighteen German non-governmental organisations have joined the WASH network. Anja Perkuhn is a Munich-based journalist. She works for the Abendzeitung.